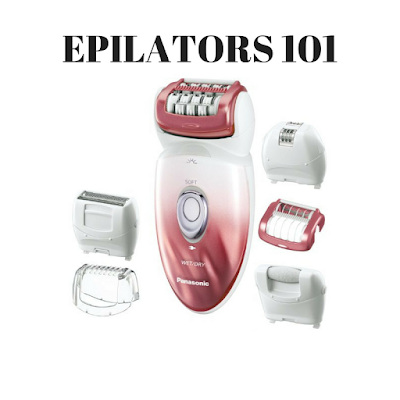 Whether you have heard about epilators or not, you’re going to quickly understand what an epilator is, how it should be used and which are the features to look for when purchasing one. I have been using an epilator for a few years now and I love it! If you haven’t heard about these hair removal devices, here is some information on this great product. An Epilator is a device that removes hairs from the root using tiny metallic/ceramic tweezers. Many are removed from the root with one single pass. The tweezers rotate and they grab the hairs and pull them from the root. Because the hair is being pulled out by the root, you can have smooth skin for two weeks up to a month - pretty awesome! If you decide to use one you may never go back to shaving! That’s what happened to me. If you are like me and get tired of using razors every second day and feel frustrated because a day later the hairs start growing back then an epilator is a great alternative. Epilation is an inexpensive hair removal method that costs anywhere from $30 to $100. Once you have used an epilator a few times on the area, you will notice the hair the hair grows back less frequent and it grows back thinner and lighter. With shaving I had to shave every second day, I epilate once every 2 weeks! In the beginning it probably took me up to an hour to get my legs smooth as silk but now I do both my legs in 15 – 20 minutes. The key is not to let your hair grow back too much because it will be time consuming. Also, if it’s too short, the tweezers won’t be capable of plucking it but that’s debatable since there are models that claim they can remove even the tiniest hairs. Using an epilator will hurt a bit at first, (tweezing several hairs all at one time is going to be uncomfortable) but just like with waxing, it gets easier the more you get used to it. Once I passed the device over a section a couple of times on my legs then the pain was not as bad. You want to move the epilator slowly against the direction in which the hair is growing. You want to use slow motions because it allows the device to grab the hair. - It must remove the hairs from the root as apposed to something that cuts the hair at the surface of the skin. - The more tweezers it has, the less time each epilation session will take. Some epilators come with 21 tweezers and it can go up to 72 tweezers. - Easy cleanup. Luckily, it’s really easy to have a clean epilator most include a little brush to get in between the tweezers. - Built-in light ensures that you won’t miss any hairs – so helpful! - Number of speeds, there are few epilators who have just one speed. I found the 2 speed epilators worked best. Different speeds for different body parts. - Corded or cordless (rechargeable or battery operable). I personally prefer rechargeable. Considering all these features, I will try to describe what worked for me and maybe it will help you figuring out what you need and want. The best epilator for me is quite a simple basic device with 2 speeds, rechargeable offers enough freedom of movement and has built-in light. I’m personally not interested in wet & dry ones but I have heard if you don’t handle pain well, you can always go for a wet and dry and use it under the shower in the beginning because it is less painful. At first it will feel uncomfortable but you will get used to feeling and it will no longer hurt. If you’ve waxed before, you may feel nothing more than a few pinches. At first, you can keep it basic and simple with a cheaper epilator and see if you have smooth skin longer and then upgrade to a more expensive device. This is money spent once and maybe not spent for another 2 or 3 years, they usually come with a standard 2-year warranty. Some epilators come with accessories, choose the accessories that you need. In my experience, the epilator itself is more or less the same - same tweezers and features. Only the accessories make the difference in price. Here is a list of Epilators I have tried and the features they have. The Philips Satinelle HP6401 is the perfect example of a classic epilator. It’s a basic Epilator - nothing fancy but it does its job of removing hairs really good, it offers very satisfactory performances. The price is the lowest. It’s corded, it has two speeds, it has an efficiency cap which ensures gentle epilation in sensitive areas, and the design is ergonomically shaped makes it easy to hold. Another great feature is that it has a Washable epilation head. It has 21 tweezers. It’s not a lot, but it’s a great starter device. The only negative I found with this device is that it doesn’t have a built-in light but that’s more of a preference on my part. Also, Philips HP6401 doesn’t come with a cleaning brush but that is replaced by the washable epilation head, if you need to, you can use a toothbrush to clean the tweezers. I think it’s totally worth it, given the low price and I especially recommend it if you are on a tight budget and want to keep it simple and classic. I liked the design of this, it’s so girly! It’s a wet & dry epilator, which means you can use it with shower gel. It is cordless – it gets fully charged in an hour and you get to use it for up to 40 minutes. It has 48 tweezers and spins really fast. This is the least painful epilator and the side-to-side gliding head is a feature that helps. There are two epilating heads included: the wide dual-disc epilation head and the gentle epilator head. It’s convenient to switch between the two heads when it comes to removing hairs from sensitive areas. The Panasonic ES-ED90-P comes with the tweezers head (epilator head), a shaver head, a bikini trimmer head and a pedicure buffer for removing dry callous skin. The tweezer head is the only one that removes hair from the root, the other two attachments are more like shavers and cut at the surface of the skin, the shaver head cuts the hairs more closely to the skin than the trimmer head. All the heads can be used with either foam/soap or directly on the bare skin. This is a 2-speed epilator and it also has a built-in light and includes a travel pouch and a cleaning brush. This is a great device and the attachments are helpful and easily switchable. It is a little pricey but worth the 2 year investment. The Emjoi AP-18 has two opposed heads, together have 72 tweezers so it’s a fast epilator. It also has a feature called Middle Finger Lifting, which means it can efficiently lift and remove flat and short hairs, it states it can remove hairs as short as 0.5mm. There is very little pain because of the 72 powerful tweezers. It is a corded device, features 2 speeds and it comes with a cleaning brush plus the head is detachable so it can be washed. It uses Silver Ion Technology which provides antimicrobial protection, and may also help with reducing ingrown hairs. It’s not only good for women but also for men because it’s fast and powerful. The alternative is the specifically designed epilator for men - Emjoi AP-18MS. It’s not a big deal but it doesn’t have a built in light, it’s just my preference to have one. It’s medium-priced and worth every penny. This one is great for women who want to take a relaxing bath and get some hairs removed at the same time. It’s also powerful enough to be a good epilator for men. Being wet and dry, it’s cordless – takes 1 hour to charge and it functions for up to 40 minutes and it is easy to clean. It has 40 tweezers but is powerful. The close-grip tweezers can pluck hairs as tiny as 0.5mm. This one comes with a trimmer head, shaver head, and tweezers head but also has included a facial head, sensitive area head also called the underarm cap, which can perfectly work for the bikini area as well, and an efficiency head. It has a pivoting head, the built-in light, 2 speeds, and includes pre-epilation wipes. I found the epilation wipes don’t do much, other than make the area smell nice. This epilator is the complete package, it’s worth the extra money, as long as you are comfortable with spending that amount. It’s a bit heavy compared to other epilators but I didn’t find that be a huge problem. Braun Silk Epil 9579 is also a wet & dry epilator. It has a 40% wider head than other epilators and it has 40 tweezers that range in shape and size. The tweezers have the micro-grip technology for removing really tiny hairs. One feature is the “soft-lift” tips for lifting up flat-lying hairs but I didn’t really notice a difference with the overall performance. It’s a cordless device, 40 minutes of usage after charging it for 1 hour. Comes in 2 speeds and has a built-in light. Braun Silk Epil 9579 comes with 7 extra accessories, massage rollers (that ease the pain a little), a pivoting head, skin contact cap, facial head, trimmer head, a charging stand and facial cleansing brush - a complete grooming set! My only negative is the really high price - not everyone can afford this epilator. That’s it, these are my 5 epilator reviews, what do you think, which one will you try?